Andy Warhol is an artist. Marge mentioned him when Homer saw one of his paintings of Campbell's Soup Cans. 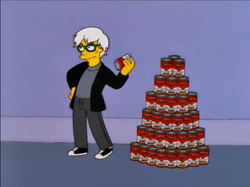 Later, Homer had a dream where Warhol was throwing the soup cans at Homer. He then was about to throw a larger can of Split-Pea soup at Homer before he woke up. Modified on June 27, 2013, at 08:10.